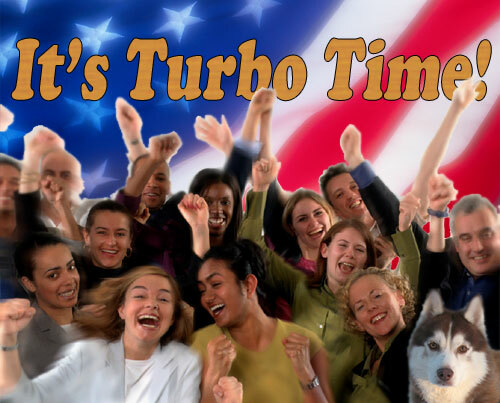 World of Turbo: Win In New Hampshire! Thank you, all of you fine citizens of New Hampshire for your support! We are continuing to send a strong message to the human candidates that my campaign is the only one that can deliver change. No one can stop our campaign now! We now travel to Michigan, then Nevada, and then South Carolina. I khan sooo pikhuture you getting on AirForceOne and spreading Sibe hair throughout the world!! All part of helping show the stoopid humans how missions REALLY get akhkhomplished!!! Maybe we can rename the jet "Sibe Hair Force One"? Yet another example of why WOO are THE MAN WITH THE PLAN FUR CHANGE!!!! Clearly the artists need to begin working on a Tubey Monument. Your khampaign khordinator knows how to say it simply, yet elegantly and to the point. You khouldn't have chosen better!